Sorry for the week off, folks. Unfortunately stuff has been happening IRL (mostly me having to move, which has been a crazy, crazy undertaking). I’m really still not done, and the lack of sleep/rest has totally been getting to me. Here’s to renewed energy for Comic Con! 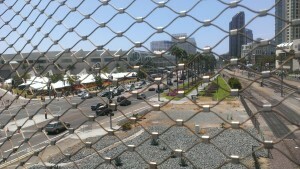 SDCC is Here! Finally, the crew and I have found a place to stay for the week. Unfortunately, it’s been split between two different spots – one during the week and one during the weekend, but hey, that’s cool! We’ve a place to stay!!! Also, if you happen to be at SDCC, I’ll be sitting on the Tomb Raider panel on Saturday in Room 25ABC! The Evolution of an Icon in Rise of the Tomb Raider will take place at 5pm, and I’ll be sitting alongside some of the devs from Crystal Dynamics as well as Camilla Luddington, the voice of Lara Croft, and Rhianna Pratchett, the game’s writer! I. Am. Excites. On of my pipe dreams has always been to sit on a panel at SDCC, promoting a project I’ve worked on, and now… wh0000h0000000!! Anime Expo is happening right now. I got a chance to check out the floor yesterday! Twas fun. Unfortunately, moving is still in progress, so I’ll have to miss out on Sunday. Hope to be there for the more full experience next year. PAX is still a pipe dream. I’ve barely had enough time to figure out the housing situation for SDCC, let alone figure out a way to get to PAX. Hopefully things will slow down a bit after SDCC! SDCC last minute prep. Need to figure ride/parking/trolley situations for the week. Also, have to do much, much laundry. A 99-cent store trip is needed to grab some in-con vittles (trail mix, jerky, nuts, water). I’ve also not had the chance to get any walking in lately, as most of my energy has been taken up in moving lately. I did pick up some new insoles, and those feel cushy. Start redoing/polishing video game voice demo Wasn’t able to finish in time for E3 Maybe for SDCC? 2 Days! Spiffy up website at earlbaylon.com Done, yo. Spiffy up AgentsOfGUARD.com in prepfor SDCC 2 days! AHH! My FearTASTIC time at The Great Horror Campout 2015! 5 Movie Franchises that didn’t have a huge SDCC Panel!